European societies of today are characterized by a growing diversity regarding languages, cultural preferences and the emergence of socioeconomic opportunities spanning across national, cultural or linguistic borders. Hence, it has commonly become accepted that languages foster opportunities for economic, political and cultural participation for the citizens of Europe. Languages foster social cohesion and, last but not least, personal growth. For this reason, the EU has adopted and supports policy measures for education towards the education of plurilingual citizens within the fundamentally multilingual world of contemporary European societies. Education towards plurilingualism is at the very heart of European integration, and it is closely linked with the strife for socioeconomic, political and cultural equity. If seen against this scene, it seems rather problematic that the field of foreign language education has widely kept its monolingual character: Foreign language education has remained an issue of national cultures, national research traditions and national educational systems. The notion of teaching different languages as single and separate systems is largely unquestioned as are local language teaching policies and practices. Junior researchers who enter the field at the early stages of their careers find it in a paradoxically monolingual state. The ENROPE project works at the interface of language education research and language teaching. Its rationale takes multi- and plurilingualism as a social and personal given. Hence, ENROPE will encourage researchers as well as educators in foreign language education to develop a more plurilingual mind-set as well as a professional habitus that reflects language education research and language teaching practices in the light of societal multilingualism and individual plurilingualism. The project will establish a sustainable network for junior researchers in foreign language education and aim for the development of strong and reflected professional identities. As part of this aim, ENROPE will create an Intensive Study Programme (ISP) which will provide junior researchers with opportunities for transborder collaboration and professional qualification. The ISP will consist of three annual training weeks, linked and enhanced through regular online training phases, and it will foster collaboration and qualification at two intersecting levels: 1) specialist thematic exchange and reflection of research practices in the light of multi- and plurilingualism, and 2) reflection on and development of the researchers’ own professional identities with regard to multi- and plurilingualism. The project, therefore, combines professional qualification through collaboration with a pedagogical agenda through experiential learning and reflection. By bringing together junior researchers from various disciplines involved in language education research, ENROPE ensures an inter- and transdisciplinary environment for academic exchange and reflection. By aiming at educational researchers and, vice-versa, at researching educators as its target group, the project capitalises on the mutual reinforcement of research and education. With the default career paths in language education research typically oscillating between the domains of language teaching and research, this project will produce a Qualification Handbook for researchers and supervisors to improve the qualification, recruitment and selection of future professionals and leaders in language education. ENROPE promotes inquiry-based and research-related classroom development that is sensitive to the linguistic ecology of classrooms and their environments as a means of promoting high-quality and innovative language teaching. Further, the development of an Online Platform for researcher collaboration and professional reflection will provide a versatile and open digital environment for distance-learning and networking in the context of multi- and plurilingualism. 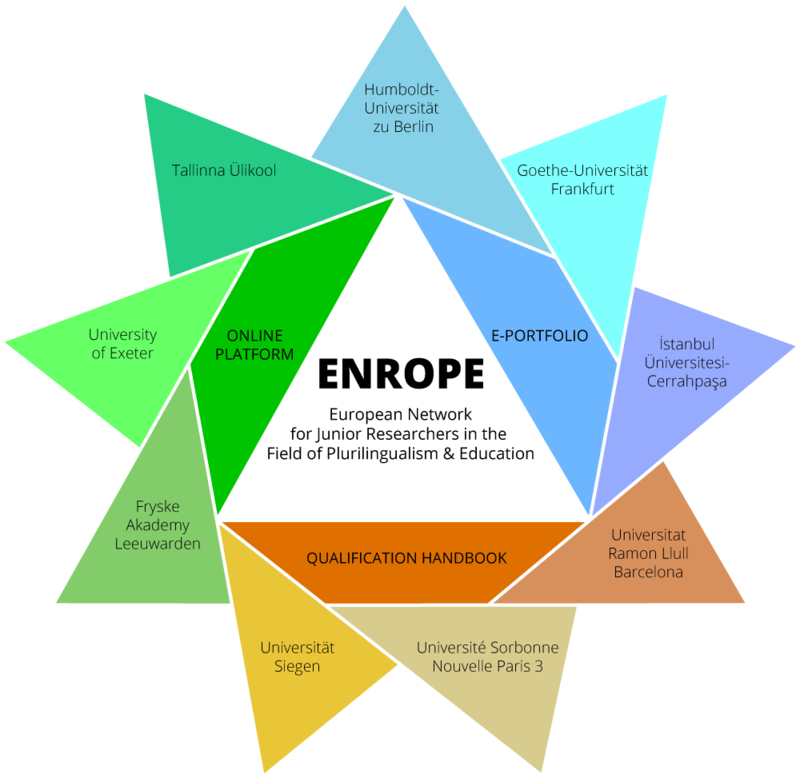 The embedded E-Portfolio will function as an empowering tool for researchers in language education and language educators alike to engage in meaningful professional reflection that reaches beyond the instrumental skills of the academic disciplines and which will, therefore, be open for adaptation in every educational field affected - directly or indirectly - by multi- and plurilingual ecologies. ENROPE will be realised by a consortium consisting of nine European partners (eight universities and one research centre) representing a wide array of languages and disciplines. The consortium is complemented by a large network of associated partners from within Europe and beyond, which will facilitate ENROPE’s outreach and sustainability throughout and after the project’s lifetime.